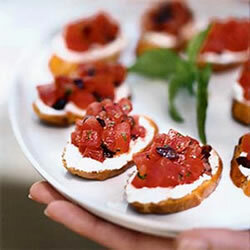 Bruschetta Slider with Spicy Grilled Chicken | Cooking Wine And Travel - The site where Foodies Unite! This is a unique play on bruschetta and sliders. The secret to this dish is brining the chicken well in advance. You will need an over and outdoor grill to prepare this dish. In the absence of a grill, you can sear the chicken in a preheated pan on high heat. Mix the brine ingredients and let set until the sugar and salt are fully dissolved. Place chicken breasts in a sealable container and pour in brine mixture until the chicken is fully covered. Seal and place in the refrigerator for at least 2 hours (overnight is preferred). Remove chicken from the brine mixture and rinse and dry each piece thoroughly. Cut each chicken breast into pieces that are slightly smaller than the baguette slices. Hand rub the chicken pieces with the Creole Seasoning, salt and pepper. Using a covered baking dish, lightly coat the bottom of the dish with olive oil, then pour in the chicken broth. Set the chicken pieces in the broth, cover and bake for 30 minutes turning once. Prepare the crustini by lightly brushing the baguette slices with olive oil and toasting until golden brown. Prepare the caramelized onions by sauteing them with one tablespoon of olive oil in a preheated pan on high heat. When the onions start to turn dark brown (approximately 10-12 minutes), add the sugar and white wine. Reduce the heat and cook until the wine is fully reduced. Turn off the heat and set aside. Remove the chicken from the baking dish and lightly brush with olive oil on all sides. Grill until golden brown (approximately 5 minutes on each side). If you do not have a grill, you can sear the chicken in a preheated pan on high heat. Layer each crustini as follows: Spread a layer of Roasted Pepper Salsa on the custini, slice of pickle, chicken and a layer of caramelized onions on top.